If you experience an outage, please use the free "Gibson EMC" app or call 1-800-977-4076 to report the outage immediately. At Gibson EMC, we work diligently to deliver reliable electric service, but unfortunately, we sometimes have outages. Our staff stands ready to receive your call 24-hours, seven days a week, 365 days a year. Our state-of-the-art outage management and voice recognition system also answers when there are large numbers of incoming calls. To report an outdoor light or street light problem, just call your local Gibson EMC member service center or our 24-hour dispatch center at 1-731-855-4740. Please be sure to tell us that you are calling about an outdoor light or a street light and provide the light’s location. We will make the needed repairs as quickly as possible. Keep refrigerator and freezer doors closed. Refrigerated food will remain good for only four to six hours. Place a thermometer inside the refrigerator. If the temperature rises above 40 degrees, the food may spoil. The optimum time for frozen food is 72 hours; but, as long as food in the freezer still has ice crystals on it, it is safe. If food is thawed, but still cold, it can safely be cooked (if there is a cooking source) and frozen again. Be very careful with emergency cooking and heating equipment such as camp stoves and fireplaces. Do not use charcoal grills inside your home; charcoal fumes are poisonous in an unventilated area. While the power is off, turn off your major electrical appliances such as water heaters and heating systems. After the power comes back on, wait about 15 minutes and then turn on the appliances one at a time. This will help avoid additional outages caused by overloads. If you have a heat pump and the outage lasts for three hours or more, do not immediately reset it to the “on” position once power is restored. Instead, wait a few minutes and place the system switch in the “emergency heat” position. This will quickly bring your home to normal temperature. Leave the switch in the “emergency heat” position for 24 hours. At the end of 24 hours, set the thermostat for heat pump operation. This will restart your unit in the heat pump mode. Finally, be sure to stay away from downed electric lines and report them to Gibson EMC immediately. Strong winds and power lines can cause downed power lines; and fallen power lines can be deadly. If you see a power line on the ground, or if a tree falls on a line, STAY AWAY! Always assume the line is energized. Remember -- a tree on a power line can act as a conductor. That means you can be fatally wounded by touching only the tree. And if you try to help a victim of these circumstances, you could also be injured by touching either the victim or the tree. Stand guard, if possible, to keep others away from danger. Portable electric generators can be a “life-saver” when faced with a lengthy outage, but if they are not installed and used properly, they also can cause serious injury and even death. After Hurricane Katrina, for example, many people relied on generators. But improper use caused five deaths, according to the Centers for Disease Control and Prevention (CDC). The CDC also reported 51 cases of carbon monoxide poisoning. Be sure to follow all manufacturer directions for installation and operation. To prevent electric shock, make sure your generator is properly grounded. The operation manual should provide correct grounding instructions. Operate electric generators or other fuel-powered machines outdoors, where deadly carbon monoxide fumes cannot enter the home. Use a generator only in a well-ventilated and dry area located away from air intakes to the house. Do not use a generator in an attached garage. Do not overload the generator by operating more appliances and equipment than the generator can handle. The operating instructions should have an output rating for the generator. Individual appliances should be plugged directly into the receptacle outlet of the generator, using appropriately sized extension cords to carry the electric load. Make sure the cords are rated for outdoor use, have a grounded, three-pronged plug, and are in good condition. Do not run the extension cord(s) under rugs. Never connect generators directly to your home’s wiring. The reverse flow of electricity can electrocute an unsuspecting lineworker attempting to restore electric service. Never plug a generator into a household outlet. Do not refuel a generator while it is running. Only store fuel outside of living areas and away from heat sources, like water heater pilot lights. Keep children and pets away from generators. Gibson Electric Membership Corporation’s employees stand ready to respond quickly if there is an outage. Our personnel are monitoring Gibson EMC’s electric system and are available to take members’ telephone calls 24-hours-a-day, every day. Computerized equipment is strategically located on the physical electric system to alert Gibson EMC personnel if there is a major outage. However, members are always encouraged to call if they experience an outage. As soon as we are aware an outage exists, Gibson EMC dispatches personnel to restore service. When restoring service, Gibson EMC gives first priority to critical services including police and fire departments, and water and sewer stations. The next step is to restore the main feeder lines from substations; these lines serve and will restore power to the greatest number of members. Finally, Gibson EMC makes repairs that will restore service to individual homes and businesses. While it may be frustrating for members to see us working in an area and leaving it before restoring everyone’s electric service, the restoration process outlined above enables Gibson EMC to help the most members in the shortest amount of time. 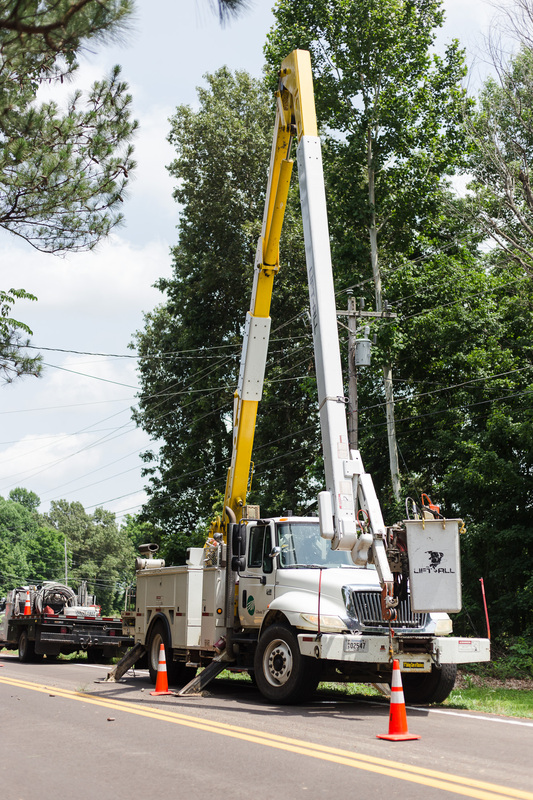 In any outage, Gibson Electric Membership Corporation works as quickly as possible to restore power to its members. The cooperative maintains a list of members who have demonstrated medical necessity for Priority Service. These accounts are flagged in Gibson EMC’s member database. We attempt to contact these members before planned outages and try to give them priority in weather-related and other emergency outages. All households with residents dependent upon life support should call 731-562-1615 or contact any Gibson EMC member service center. A medical verification letter from an attending physician will be required for Priority Service status. They are priced affordably at $33 (plus tax). You may pay at the time of purchase or have it charged to your next Gibson EMC electric bill. Call or visit your local member service center for details. Click here for member service center locations and phone numbers. Having your updated telephone number(s) will help us to help you. Our outage management and voice recognition systems use caller identification technology to link your telephone number(s) to your service address. This means that if you have a power outage and call to make us aware of it, your outage location can be pinpointed based on your caller ID and the associated phone number and location information in your Gibson EMC member data file. And, when multiple calls come in from the same area, our automated systems aid Gibson EMC personnel in gauging the magnitude of the outage; this is important information that determines the manpower and equipment that should be dispatched. In order to help us serve you better, please call our toll-free number, 1-800-977-4076, to verify that the number we have associated with your service address is correct.